Dr, Marcus Favorite serves the Oklahoma City, Deer Creek and Edmond communities. He is a certified Chiropractor who has attended the Oklahoma State University for completing his undergraduate education. He has obtained his Doctorate of Chiropractic from the Parker College of Chiropractic in Dallas. Having completed his degree in Chiropractic care, Dr, Favorite returned to the Oklahoma City in order to remain in close contact with his friends and family and also for helping a large number of individuals through chiropractic. 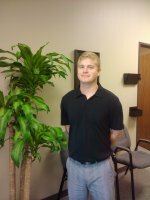 He is the third member of his family to serve as a Certified Chiropractor in Edmond. Both his brother-in-law and his elder brother serve as chiropractors. Prior to graduating from the Oklahoma State University, Dr. Favorite finished off with a year of internship at the Put Patient Clinic of Parker College, Dallas. He was also selected to take part in the Abroad Program of the clinic. By way of this program, Dr, Favorite spent around three months treating the sports individuals at the Olympic along with the general public in Costa Rica’s stunning San Jose. Dr. Favorite is thankful for having a job that he actually enjoys and loves. He is very excited about being back in the Oklahoma City and is also looking forward to coming up with a great life in this exotic city. Dr. Marcus Favorite has done a commendable job in freeing individuals from pain. Serving in the form of a Chiropractor possessing great experience, Dr. Favorite is completely dedicated to boosting the well-being and the health of all his patients. He makes the effective use of the “whole person approach” to wellness for optimizing conditions for the normal functioning of his patients. He makes use of this approach for looking into the underlying or the root causes of any disruption or disturbance which might or might not be resulting in the symptoms. The same approach is used by Dr. Favorite for making lifestyle adjustments and interventions that would make his patients feel comfortable and in good health. By making use of this exclusive treatment approach, Dr. Favorite has been successful in accelerating and maintaining his patients’ journey to proper health and well-being. We offer a logical way to deal with nature pharmaceutical in an agreeable and well disposed condition.